The First Congregational Church, also known as Jube Memorial Church, was re-organized on June 24, 1851. The original organization took place on May 22, 1834 as the First Free Presbyterian Church. An act of the Presbytery of Newark disconnected this church on June 16, 1840. It then became an independent church. Eleven years later it became the First Congregational Church. In May, 1907 the name Jube Memorial was added to the church in honor of John P. Jube. The church was dissolved in 1946. History of the First Congregational Jube Memorial Church of Newark, NJ. May 22, 1834 - Organized First Free Presbyterian Church by the Presbytery of Newark. June 16, 1840 - The Free Church was disconnected by act of Presbytery and became independent as well as free. 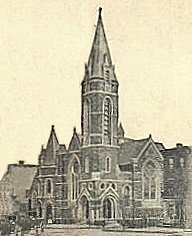 June 24, 1851 - Became First Congregational Church, 15 Clinton Avenue to June 28, 1891. Dec. 21, 1892 to May, 1907 - The words, Jube Memorial, in honor of the late John P. Jube, were added to the name of the church, 29 Clinton Avenue, C. Wright. Nov. 1946 - First Congregational Jube Memorial Church dissolved and edifice sold to the congregation of St. Nicholas Church (Greek Orthodox). This church never occupied the building. (Information from Newark Public Library). Address of church 210 Clinton Avenue. Gives relief to its own destitute members and in instances to nonmembers. Has aided in the support of the Bethlehem Congregational Church. New Jersey Historical Society - Notebook, 1850-1878, 1 volume, Call Number MG 880. This is listed under Archives - Documents, Manuscripts, etc. It includes sermon outlines; birth, baptism, communion, and marriage records kept for the First Congregational Church of Newark, New Jersey.